The guests of the Eurostars Montgomery Hotel Brussels will find themselves in close proximity to the European Communities and only 5 kilometers from the city center. Nearby the hotel are such attractions as the Royal Museum of Art and History, the Belgian Comic Strip Centre, and Cinquantenaire Park. Amenities of the hotel include a gymnasium, a sauna, and a bar, as well as the La Duchesse Restaurant. 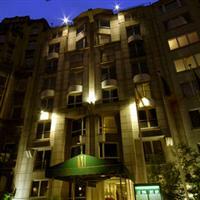 The Eurostars Montgomery Hotel Brussels is located only ten kilometers from the Brussels Airport, and is 100 meters from the nearest metro station. Public transit can take guests around the city as well as to the local airport. Rooms at the Eurostars Montgomery Hotel Brussels include wireless Internet, televisions, cable, DVD players, telephones, hairdryers, and more, as well as décor that is either Asian, marine, or romantic in design. The Eurostars Montgomery Hotel Brussels is conveniently located near the center of Brussels, close to many public transit stops. There are many amenities in the area including a number of museums, shops, and dining options.